In honor of Beebe's 100th Anniversary, The Fork + Flask at Nage chose Beebe Healthcare's Women's Health Services as the beneficiary of its 8th Annual Nage Wine & Food Festival – a celebration to benefit Beebe Healthcare’s Women’s Health Services. 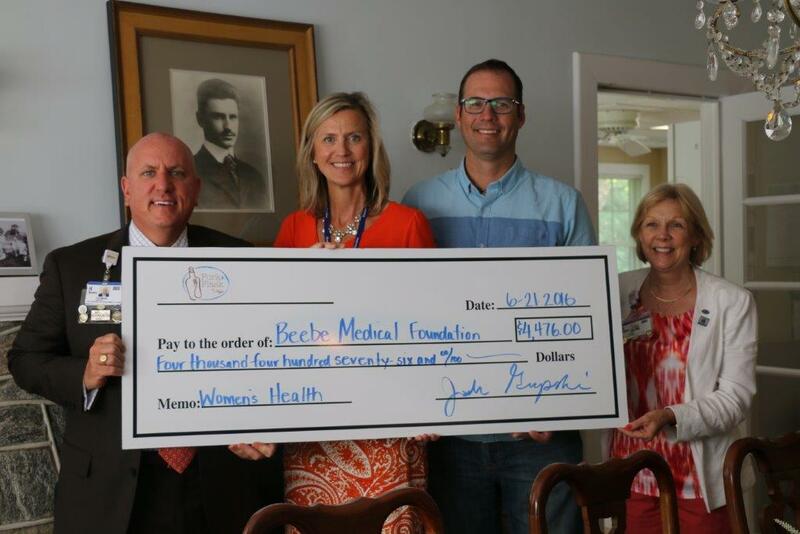 The Rehoboth Beach restaurant made a donation of $4,476, which will go towards the purchase of new comfort chairs for visitors in patient rooms in the Women's and Children’s unit. To learn more about how you can give to Beebe, or choose one of its many services as the beneficiary of your event, please contact the Beebe Medical Foundation at (302) 644-2900. Caption: Pictured here, from left to right, are: Tom Protack, Vice President of the Beebe Medical Foundation; Bridget Buckaloo, Executive Director of Women’s Health; Josh Grapski, owner, Fork + Flask at Nage; and Judy Aliquo, President and CEO of Beebe Medical Foundation.